1 A None No Power Seat 1 A is a standard Business Class seat that transforms into a fully lie-flat bed and is located at a bulkhead. There is additional privacy due to the location at the bulkhead, however, the proximity to the galley and lavatory area might be bothersome. 1 D None No Power Seat 1 D is a standard Business Class seat that transforms into a fully lie-flat bed and is located at a bulkhead. There is additional privacy due to the location at the bulkhead, however, the proximity to the galley and lavatory area might be bothersome. 1 H None No Power Seat 1 H is a standard Business Class seat that transforms into a fully lie-flat bed and is located at a bulkhead. There is additional privacy due to the location at the bulkhead, however, the proximity to the galley and lavatory area might be bothersome. 1 L None No Power Seat 1 L is a standard Business Class seat that transforms into a fully lie-flat bed and is located at a bulkhead. There is additional privacy due to the location at the bulkhead, however, the proximity to the galley and lavatory area might be bothersome. 10 A None No Power Seat 10 A is a standard Business Class seat that transforms into a fully lie-flat bed. 10 D None No Power Seat 10 D is a standard Business Class seat that transforms into a fully lie-flat bed. 10 H None No Power Seat 10 H is a standard Business Class seat that transforms into a fully lie-flat bed. 10 L None No Power Seat 10 L is a standard Business Class seat that transforms into a fully lie-flat bed. 13 A None No Power Seat 13 A is a standard Premium Economy seat located at a bulkhead. There is additional legroom, however, floor storage for personal items is not available for use during takeoff and landing. 13 C None No Power Seat 13 C is a standard Premium Economy seat located at a bulkhead. There is additional legroom, however, floor storage for personal items is not available for use during takeoff and landing. 13 D None No Power Seat 13 D is a standard Premium Economy seat located at a bulkhead. There is additional legroom, however, floor storage for personal items is not available for use during takeoff and landing. 13 E None No Power Seat 13 E is a standard Premium Economy seat located at a bulkhead. There is additional legroom, however, floor storage for personal items is not available for use during takeoff and landing. 13 G None No Power Seat 13 G is a standard Premium Economy seat located at a bulkhead. There is additional legroom, however, floor storage for personal items is not available for use during takeoff and landing. 13 H None No Power Seat 13 H is a standard Premium Economy seat located at a bulkhead. There is additional legroom, however, floor storage for personal items is not available for use during takeoff and landing. 13 J None No Power Seat 13 J is a standard Premium Economy seat located at a bulkhead. There is additional legroom, however, floor storage for personal items is not available for use during takeoff and landing. 13 L None No Power Seat 13 L is a standard Premium Economy seat located at a bulkhead. There is additional legroom, however, floor storage for personal items is not available for use during takeoff and landing. 14 A None No Power Seat 14 A is a standard Premium Economy seat. 14 C None No Power Seat 14 C is a standard Premium Economy seat. 14 D None No Power Seat 14 D is a standard Premium Economy seat. 14 E None No Power Seat 14 E is a standard Premium Economy seat. 14 G None No Power Seat 14 G is a standard Premium Economy seat. 14 H None No Power Seat 14 H is a standard Premium Economy seat. 14 J None No Power Seat 14 J is a standard Premium Economy seat. 14 L None No Power Seat 14 L is a standard Premium Economy seat. 15 L None No Power Seat 15 L is a standard Premium Economy seat. 17 A None No Power Seat 17 A is a standard Economy Class seat located at a bulkhead and in an area designated as Main Cabin Extra. The seat features additional legroom and may be selected for an additional fee. The tray table and inflight entertainment monitor are installed in a fixed armrest, therefore, seat width is slightly reduced. Floor storage for personal items is not available for use during takeoff and landing. 17 B None No Power Seat 17 B is a standard Economy Class seat located at a bulkhead and in an area designated as Main Cabin Extra. The seat features additional legroom and may be selected for an additional fee. The tray table and inflight entertainment monitor are installed in a fixed armrest, therefore, seat width is slightly reduced. Floor storage for personal items is not available for use during takeoff and landing. 17 D None No Power Seat 17 D is a standard Economy Class seat located at a bulkhead and in an area designated as Main Cabin Extra. The seat features additional legroom and may be selected for an additional fee. The tray table and inflight entertainment monitor are installed in a fixed armrest, therefore, seat width is slightly reduced. Floor storage for personal items is not available for use during takeoff and landing. 17 E None No Power Seat 17 E is a standard Economy Class seat located at a bulkhead and in an area designated as Main Cabin Extra. The seat features additional legroom and may be selected for an additional fee. The tray table and inflight entertainment monitor are installed in a fixed armrest, therefore, seat width is slightly reduced. Floor storage for personal items is not available for use during takeoff and landing. 17 G None No Power Seat 17 G is a standard Economy Class seat located at a bulkhead and in an area designated as Main Cabin Extra. The seat features additional legroom and may be selected for an additional fee. The tray table and inflight entertainment monitor are installed in a fixed armrest, therefore, seat width is slightly reduced. Floor storage for personal items is not available for use during takeoff and landing. 17 H None No Power Seat 17 H is a standard Economy Class seat located at a bulkhead and in an area designated as Main Cabin Extra. The seat features additional legroom and may be selected for an additional fee. The tray table and inflight entertainment monitor are installed in a fixed armrest, therefore, seat width is slightly reduced. Floor storage for personal items is not available for use during takeoff and landing. 17 K None No Power Seat 17 K is a standard Economy Class seat located at a bulkhead and in an area designated as Main Cabin Extra. The seat features additional legroom and may be selected for an additional fee. The tray table and inflight entertainment monitor are installed in a fixed armrest, therefore, seat width is slightly reduced. Floor storage for personal items is not available for use during takeoff and landing. 17 L None No Power Seat 17 L is a standard Economy Class seat located at a bulkhead and in an area designated as Main Cabin Extra. The seat features additional legroom and may be selected for an additional fee. The tray table and inflight entertainment monitor are installed in a fixed armrest, therefore, seat width is slightly reduced. Floor storage for personal items is not available for use during takeoff and landing. 18 A None No Power Seat 18 A is a standard Economy Class seat located in an area designated as Main Cabin Extra and is missing a window. The seat features additional legroom and may be selected for an additional fee. 18 B None No Power Seat 18 B is a standard Economy Class seat located in an area designated as Main Cabin Extra. The seat features additional legroom and may be selected for an additional fee. 18 C None No Power Seat 18 C is a standard Economy Class seat located in an area designated as Main Cabin Extra. The seat features additional legroom and may be selected for an additional fee. The tray table and inflight entertainment monitor are installed in a fixed armrest, therefore, seat width is slightly reduced. Floor storage for personal items is not available for use during takeoff and landing. 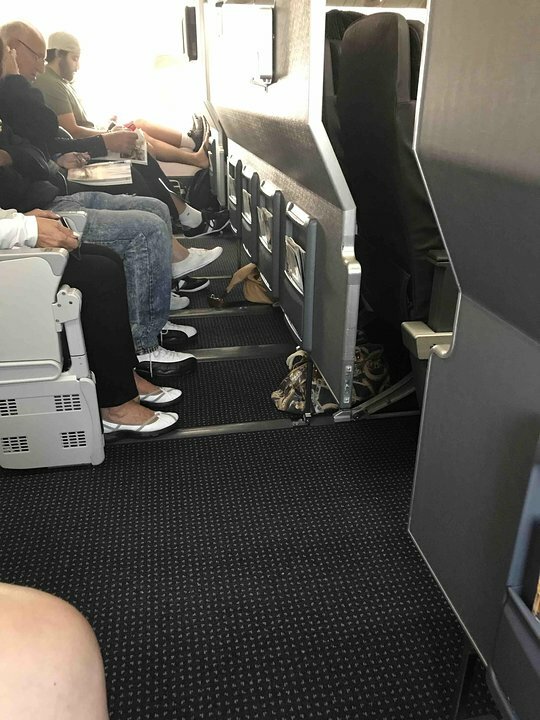 The seat position might be awkward because it is located in an aisle, therefore, the occupant might be bumped from crew, carts, and/or passengers passing. 18 D None No Power Seat 18 D is a standard Economy Class seat located in an area designated as Main Cabin Extra. The seat features additional legroom and may be selected for an additional fee. 18 E None No Power Seat 18 E is a standard Economy Class seat located in an area designated as Main Cabin Extra. The seat features additional legroom and may be selected for an additional fee. 18 G None No Power Seat 18 G is a standard Economy Class seat located in an area designated as Main Cabin Extra. The seat features additional legroom and may be selected for an additional fee. 18 H None No Power Seat 18 H is a standard Economy Class seat located in an area designated as Main Cabin Extra. The seat features additional legroom and may be selected for an additional fee. 18 J None No Power Seat 18 J is a standard Economy Class seat located in an area designated as Main Cabin Extra. The seat features additional legroom and may be selected for an additional fee. The tray table and inflight entertainment monitor are installed in a fixed armrest, therefore, seat width is slightly reduced. Floor storage for personal items is not available for use during takeoff and landing. The seat position might be awkward because it is located in an aisle, therefore, the occupant might be bumped from crew, carts, and/or passengers passing. 18 K None No Power Seat 18 K is a standard Economy Class seat located in an area designated as Main Cabin Extra. The seat features additional legroom and may be selected for an additional fee. 18 L None No Power Seat 18 L is a standard Economy Class seat located in an area designated as Main Cabin Extra and is missing a window. The seat features additional legroom and may be selected for an additional fee. 19 A None No Power Seat 19 A is a standard Economy Class seat located in an area designated as Main Cabin Extra. The seat features additional legroom and may be selected for an additional fee. 19 B None No Power Seat 19 B is a standard Economy Class seat located in an area designated as Main Cabin Extra. The seat features additional legroom and may be selected for an additional fee. 19 C None No Power Seat 19 C is a standard Economy Class seat located in an area designated as Main Cabin Extra. The seat features additional legroom and may be selected for an additional fee. 19 D None No Power Seat 19 D is a standard Economy Class seat located in an area designated as Main Cabin Extra. The seat features additional legroom and may be selected for an additional fee. 19 E None No Power Seat 19 E is a standard Economy Class seat located in an area designated as Main Cabin Extra. The seat features additional legroom and may be selected for an additional fee. 19 G None No Power Seat 19 G is a standard Economy Class seat located in an area designated as Main Cabin Extra. The seat features additional legroom and may be selected for an additional fee. 19 H None No Power Seat 19 H is a standard Economy Class seat located in an area designated as Main Cabin Extra. The seat features additional legroom and may be selected for an additional fee. 19 J None No Power Seat 19 J is a standard Economy Class seat located in an area designated as Main Cabin Extra. The seat features additional legroom and may be selected for an additional fee. 19 K None No Power Seat 19 K is a standard Economy Class seat located in an area designated as Main Cabin Extra. The seat features additional legroom and may be selected for an additional fee. 19 L None No Power Seat 19 L is a standard Economy Class seat located in an area designated as Main Cabin Extra. The seat features additional legroom and may be selected for an additional fee. 2 A None No Power Seat 2 A is a standard Business Class seat that transforms into a fully lie-flat bed. 2 D None No Power Seat 2 D is a standard Business Class seat that transforms into a fully lie-flat bed. 2 H None No Power Seat 2 H is a standard Business Class seat that transforms into a fully lie-flat bed. 2 L None No Power Seat 2 L is a standard Business Class seat that transforms into a fully lie-flat bed. 20 A None No Power Seat 20 A is a standard Economy Class seat located in an area designated as Main Cabin Extra. The seat features additional legroom and may be selected for an additional fee. 20 B None No Power Seat 20 B is a standard Economy Class seat located in an area designated as Main Cabin Extra. The seat features additional legroom and may be selected for an additional fee. 20 C None No Power Seat 20 C is a standard Economy Class seat located in an area designated as Main Cabin Extra. The seat features additional legroom and may be selected for an additional fee. 20 D None No Power Seat 20 D is a standard Economy Class seat located in an area designated as Main Cabin Extra. The seat features additional legroom and may be selected for an additional fee. 20 E None No Power Seat 20 E is a standard Economy Class seat located in an area designated as Main Cabin Extra. The seat features additional legroom and may be selected for an additional fee. 20 G None No Power Seat 20 G is a standard Economy Class seat located in an area designated as Main Cabin Extra. The seat features additional legroom and may be selected for an additional fee. 20 H None No Power Seat 20 H is a standard Economy Class seat located in an area designated as Main Cabin Extra. The seat features additional legroom and may be selected for an additional fee. 20 J None No Power Seat 20 J is a standard Economy Class seat located in an area designated as Main Cabin Extra. The seat features additional legroom and may be selected for an additional fee. 20 K None No Power Seat 20 K is a standard Economy Class seat located in an area designated as Main Cabin Extra. The seat features additional legroom and may be selected for an additional fee. 20 L None No Power Seat 20 L is a standard Economy Class seat located in an area designated as Main Cabin Extra. The seat features additional legroom and may be selected for an additional fee. 24 C None No Power Seat 24 C is a standard Economy Class seat. Due to positioning with the aisle, the seat back might be bumped by crew, carts, and/or passengers passing from the rear of the aircraft. The proximity to the lavatory area might be bothersome. 24 D None No Power Seat 24 D is a standard Economy Class seat. Seat back recline might be limited due to the bulkhead located directly behind. The proximity to the lavatory area might be bothersome. 24 E None No Power Seat 24 E is a standard Economy Class seat. Seat back recline might be limited due to the bulkhead located directly behind. 24 G None No Power Seat 24 G is a standard Economy Class seat. Seat back recline might be limited due to the bulkhead located directly behind. 24 H None No Power Seat 24 H is a standard Economy Class seat. Seat back recline might be limited due to the bulkhead located directly behind. The proximity to the lavatory area might be bothersome. 24 J None No Power Seat 24 J is a standard Economy Class seat. Due to positioning with the aisle, the seat back might be bumped by crew, carts, and/or passengers passing from the rear of the aircraft. The proximity to the lavatory area might be bothersome. 24 K None No Power Seat 24 K is a standard Economy Class seat. Seat back recline might be limited due to the bulkhead located directly behind. The proximity to the lavatory area might be bothersome. 24 L None No Power Seat 24 L is a standard Economy Class seat. Seat back recline might be limited due to the bulkhead located directly behind. The proximity to the lavatory area might be bothersome. 25 A None No Power Seat 25 A is a standard Economy Class seat. Seat back recline might be limited due to the bulkhead located directly behind. The proximity to the lavatory area might be bothersome. 25 B None No Power Seat 25 B is a standard Economy Class seat. Seat back recline might be limited due to the bulkhead located directly behind. The proximity to the lavatory area might be bothersome. 26 A None No Power Seat 26 A is a standard Economy Class seat located in an Exit Row and in an area designated as Main Cabin Extra. It may be selected for an additional fee. A window is not present at this seat, however, there is exceptional additional legroom. The tray table and inflight entertainment monitor are installed in a fixed armrest, therefore, seat width is slightly reduced. Floor storage for personal items is not available for use during takeoff and landing. The proximity to the lavatory area might be bothersome. 26 B None No Power Seat 26 B is a standard Economy Class seat located in an Exit Row and in an area designated as Main Cabin Extra. It may be selected for an additional fee. A window is not present at this row, however, there is exceptional additional legroom. The tray table and inflight entertainment monitor are installed in a fixed armrest, therefore, seat width is slightly reduced. Floor storage for personal items is not available for use during takeoff and landing. The proximity to the lavatory area might be bothersome. 26 C None No Power Seat 26 C is a standard Economy Class seat located in an Exit Row and in an area designated as Main Cabin Extra. It may be selected for an additional fee. A window is not present at this row, however, there is exceptional additional legroom. SeatGuru contributing members have reported being bumped by crew, carts, and passengers passing from the front of the aircraft. The tray table and inflight entertainment monitor are installed in a fixed armrest, therefore, seat width is slightly reduced. Floor storage for personal items is not available for use during takeoff and landing. The proximity to the lavatory area might be bothersome. 26 D None No Power Seat 26 D is a standard Economy Class seat located at a bulkhead and in an area designated as Main Cabin Extra. The seat features additional legroom and may be selected for an additional fee. The tray table and inflight entertainment monitor are installed in a fixed armrest, therefore, seat width is slightly reduced. Floor storage for personal items is not available for use during takeoff and landing. The proximity to the lavatory area might be bothersome. 26 E None No Power Seat 26 E is a standard Economy Class seat located at a bulkhead and in an area designated as Main Cabin Extra. The seat features additional legroom and may be selected for an additional fee. The tray table and inflight entertainment monitor are installed in a fixed armrest, therefore, seat width is slightly reduced. Floor storage for personal items is not available for use during takeoff and landing. 26 G None No Power Seat 26 G is a standard Economy Class seat located at a bulkhead and in an area designated as Main Cabin Extra. The seat features additional legroom and may be selected for an additional fee. The tray table and inflight entertainment monitor are installed in a fixed armrest, therefore, seat width is slightly reduced. Floor storage for personal items is not available for use during takeoff and landing. 26 H None No Power Seat 26 H is a standard Economy Class seat located at a bulkhead and in an area designated as Main Cabin Extra. The seat features additional legroom and may be selected for an additional fee. The tray table and inflight entertainment monitor are installed in a fixed armrest, therefore, seat width is slightly reduced. Floor storage for personal items is not available for use during takeoff and landing. The proximity to the lavatory area might be bothersome. 26 J None No Power Seat 26 J is a standard Economy Class seat located in an Exit Row and in an area designated as Main Cabin Extra. It may be selected for an additional fee. A window is not present at this row, however, there is exceptional additional legroom. SeatGuru contributing members have reported being bumped by crew, carts, and passengers passing from the front of the aircraft. The tray table and inflight entertainment monitor are installed in a fixed armrest, therefore, seat width is slightly reduced. Floor storage for personal items is not available for use during takeoff and landing. The proximity to the lavatory area might be bothersome. 26 K None No Power Seat 26 K is a standard Economy Class seat located in an Exit Row and in an area designated as Main Cabin Extra. It may be selected for an additional fee. A window is not present at this row, however, there is exceptional additional legroom. The tray table and inflight entertainment monitor are installed in a fixed armrest, therefore, seat width is slightly reduced. Floor storage for personal items is not available for use during takeoff and landing. The proximity to the lavatory area might be bothersome. 26 L None No Power Seat 26 L is a standard Economy Class seat located in an Exit Row and in an area designated as Main Cabin Extra. It may be selected for an additional fee. A window is not present at this seat, however, there is exceptional additional legroom. The tray table and inflight entertainment monitor are installed in a fixed armrest, therefore, seat width is slightly reduced. Floor storage for personal items is not available for use during takeoff and landing. The proximity to the lavatory area might be bothersome. 27 A None No Power Seat 27 A is a standard Economy Class seat located in an area designated as Main Cabin Extra. The seat features additional legroom and may be selected for an additional fee. 27 B None No Power Seat 27 B is a standard Economy Class seat located in an area designated as Main Cabin Extra. The seat features additional legroom and may be selected for an additional fee. 27 C None No Power Seat 27 C is a standard Economy Class seat located in an area designated as Main Cabin Extra. The seat features additional legroom and may be selected for an additional fee. 27 D None No Power Seat 27 D is a standard Economy Class seat located in an area designated as Main Cabin Extra. The seat features additional legroom and may be selected for an additional fee. 27 E None No Power Seat 27 E is a standard Economy Class seat located in an area designated as Main Cabin Extra. The seat features additional legroom and may be selected for an additional fee. 27 G None No Power Seat 27 G is a standard Economy Class seat located in an area designated as Main Cabin Extra. The seat features additional legroom and may be selected for an additional fee. 27 H None No Power Seat 27 H is a standard Economy Class seat located in an area designated as Main Cabin Extra. The seat features additional legroom and may be selected for an additional fee. 27 J None No Power Seat 27 J is a standard Economy Class seat located in an area designated as Main Cabin Extra. The seat features additional legroom and may be selected for an additional fee. 27 K None No Power Seat 27 K is a standard Economy Class seat located in an area designated as Main Cabin Extra. The seat features additional legroom and may be selected for an additional fee. 27 L None No Power Seat 27 L is a standard Economy Class seat located in an area designated as Main Cabin Extra. The seat features additional legroom and may be selected for an additional fee. 28 A None No Power Seat 28 A is a standard Economy Class seat located in an area designated as Main Cabin Extra. The seat features additional legroom and may be selected for an additional fee. 28 B None No Power Seat 28 B is a standard Economy Class seat located in an area designated as Main Cabin Extra. The seat features additional legroom and may be selected for an additional fee. 28 C None No Power Seat 28 C is a standard Economy Class seat located in an area designated as Main Cabin Extra. The seat features additional legroom and may be selected for an additional fee. 28 D None No Power Seat 28 D is a standard Economy Class seat located in an area designated as Main Cabin Extra. The seat features additional legroom and may be selected for an additional fee. 28 E None No Power Seat 28 E is a standard Economy Class seat located in an area designated as Main Cabin Extra. The seat features additional legroom and may be selected for an additional fee. 28 G None No Power Seat 28 G is a standard Economy Class seat located in an area designated as Main Cabin Extra. The seat features additional legroom and may be selected for an additional fee. 28 H None No Power Seat 28 H is a standard Economy Class seat located in an area designated as Main Cabin Extra. The seat features additional legroom and may be selected for an additional fee. 28 J None No Power Seat 28 J is a standard Economy Class seat located in an area designated as Main Cabin Extra. The seat features additional legroom and may be selected for an additional fee. 28 K None No Power Seat 28 K is a standard Economy Class seat located in an area designated as Main Cabin Extra. The seat features additional legroom and may be selected for an additional fee. 28 L None No Power Seat 28 L is a standard Economy Class seat located in an area designated as Main Cabin Extra. The seat features additional legroom and may be selected for an additional fee. 29 A None No Power Seat 29 A is a standard Economy Class seat located in an area designated as Main Cabin Extra. The seat features additional legroom and may be selected for an additional fee. 29 B None No Power Seat 29 B is a standard Economy Class seat located in an area designated as Main Cabin Extra. The seat features additional legroom and may be selected for an additional fee. 29 C None No Power Seat 29 C is a standard Economy Class seat located in an area designated as Main Cabin Extra. The seat features additional legroom and may be selected for an additional fee. 29 D None No Power Seat 29 D is a standard Economy Class seat located in an area designated as Main Cabin Extra. The seat features additional legroom and may be selected for an additional fee. 29 E None No Power Seat 29 E is a standard Economy Class seat located in an area designated as Main Cabin Extra. The seat features additional legroom and may be selected for an additional fee. 29 G None No Power Seat 29 G is a standard Economy Class seat located in an area designated as Main Cabin Extra. The seat features additional legroom and may be selected for an additional fee. 29 H None No Power Seat 29 H is a standard Economy Class seat located in an area designated as Main Cabin Extra. The seat features additional legroom and may be selected for an additional fee. 29 J None No Power Seat 29 J is a standard Economy Class seat located in an area designated as Main Cabin Extra. The seat features additional legroom and may be selected for an additional fee. 29 K None No Power Seat 29 K is a standard Economy Class seat located in an area designated as Main Cabin Extra. The seat features additional legroom and may be selected for an additional fee. 29 L None No Power Seat 29 L is a standard Economy Class seat located in an area designated as Main Cabin Extra. The seat features additional legroom and may be selected for an additional fee. 3 A None No Power Seat 3 A is a standard Business Class seat that transforms into a fully lie-flat bed. 3 D None No Power Seat 3 D is a standard Business Class seat that transforms into a fully lie-flat bed. 3 H None No Power Seat 3 H is a standard Business Class seat that transforms into a fully lie-flat bed. 3 L None No Power Seat 3 L is a standard Business Class seat that transforms into a fully lie-flat bed. 35 C None No Power Seat 35 C is a standard Economy Class seat. Due to positioning with the aisle, the seat back might be bumped by crew, carts, and/or passengers passing from the rear of the aircraft. 35 J None No Power Seat 35 J is a standard Economy Class seat. Due to positioning with the aisle, the seat back might be bumped by crew, carts, and/or passengers passing from the rear of the aircraft. 38 A None No Power Seat 38 A is a standard Economy Class seat located in a last row of the aircraft. Seat back recline might be limited due to the bulkhead wall directly behind. Also, if the seat back in front is reclined, then personal space will be reduced. The proximity to the galley area and the positioning of lavatory might be bothersome. 38 C None No Power Seat 38 C is a standard Economy Class seat located in a last row of the aircraft. Seat back recline might be limited due to the bulkhead wall directly behind. Also, if the seat back in front is reclined, then personal space will be reduced. The proximity to the galley area and the positioning of lavatory might be bothersome. 38 H None No Power Seat 38 H is a standard Economy Class seat. The proximity to the galley and lavatory area might be bothersome. 38 J None No Power Seat 38 J is a standard Economy Class seat located in a last row of the aircraft. Seat back recline might be limited due to the bulkhead wall directly behind. Also, if the seat back in front is reclined, then personal space will be reduced. The proximity to the galley area and the positioning of lavatory might be bothersome. 38 L None No Power Seat 38 L is a standard Economy Class seat located in a last row of the aircraft. Seat back recline might be limited due to the bulkhead wall directly behind. Also, if the seat back in front is reclined, then personal space will be reduced. The proximity to the galley area and the positioning of lavatory might be bothersome. 39 D None No Power Seat 39 D is a standard Economy Class seat. The proximity to the galley and lavatory area might be bothersome. 39 H None No Power Seat 39 H is a standard Economy Class seat. The proximity to the galley and lavatory area might be bothersome. 4 A None No Power Seat 4 A is a standard Business Class seat that transforms into a fully lie-flat bed. 4 D None No Power Seat 4 D is a standard Business Class seat that transforms into a fully lie-flat bed. 4 H None No Power Seat 4 H is a standard Business Class seat that transforms into a fully lie-flat bed. 4 L None No Power Seat 4 L is a standard Business Class seat that transforms into a fully lie-flat bed. 40 D None No Power Seat 40 D is a standard Economy Class seat located in a last row of the aircraft. Seat back recline might be limited due to the bulkhead wall directly behind. Also, if the seat back in front is reclined, then personal space will be reduced. The proximity to the galley area and the positioning of lavatory might be bothersome. 40 E None No Power Seat 40 E is a standard Economy Class seat located in a last row of the aircraft. Seat back recline might be limited due to the bulkhead wall directly behind. Also, if the seat back in front is reclined, then personal space will be reduced. The proximity to the galley area and the positioning of lavatory might be bothersome. 40 G None No Power Seat 40 G is a standard Economy Class seat located in a last row of the aircraft. Seat back recline might be limited due to the bulkhead wall directly behind. Also, if the seat back in front is reclined, then personal space will be reduced. The proximity to the galley area and the positioning of lavatory might be bothersome. 40 H None No Power Seat 40 H is a standard Economy Class seat located in a last row of the aircraft. Seat back recline might be limited due to the bulkhead wall directly behind. Also, if the seat back in front is reclined, then personal space will be reduced. The proximity to the galley area and the positioning of lavatory might be bothersome. 5 A None No Power Seat 5 A is a standard Business Class seat that transforms into a fully lie-flat bed. The proximity to the galley and lavatory area might be bothersome. 5 D None No Power Seat 5 D is a standard Business Class seat that transforms into a fully lie-flat bed. The proximity to the galley and lavatory area might be bothersome. 5 H None No Power Seat 5 H is a standard Business Class seat that transforms into a fully lie-flat bed. The proximity to the galley and lavatory area might be bothersome. 5 L None No Power Seat 5 L is a standard Business Class seat that transforms into a fully lie-flat bed. The proximity to the galley and lavatory area might be bothersome. 6 L None No Power Seat 6 L is a standard Business Class seat that transforms into a fully lie-flat bed. The proximity to the galley and lavatory area might be bothersome. 7 A None No Power Seat 7 A is a standard Business Class seat that transforms into a fully lie-flat bed and is located at a bulkhead. There is additional privacy due to the location at the bulkhead, however, the proximity to the galley and lavatory area might be bothersome. 7 D None No Power Seat 7 D is a standard Business Class seat that transforms into a fully lie-flat bed and is located at a bulkhead. There is additional privacy due to the location at the bulkhead, however, the proximity to the galley and lavatory area might be bothersome. 7 H None No Power Seat 7 H is a standard Business Class seat that transforms into a fully lie-flat bed and is located at a bulkhead. There is additional privacy due to the location at the bulkhead, however, the proximity to the galley and lavatory area might be bothersome. 7 L None No Power Seat 7 L is a standard Business Class seat that transforms into a fully lie-flat bed and is located at a bulkhead. There is additional privacy due to the location at the bulkhead, however, the proximity to the galley and lavatory area might be bothersome. 8 A None No Power Seat 8 A is a standard Business Class seat that transforms into a fully lie-flat bed. 8 D None No Power Seat 8 D is a standard Business Class seat that transforms into a fully lie-flat bed. 8 H None No Power Seat 8 H is a standard Business Class seat that transforms into a fully lie-flat bed. 8 L None No Power Seat 8 L is a standard Business Class seat that transforms into a fully lie-flat bed. 9 A None No Power Seat 9 A is a standard Business Class seat that transforms into a fully lie-flat bed. 9 D None No Power Seat 9 D is a standard Business Class seat that transforms into a fully lie-flat bed. 9 H None No Power Seat 9 H is a standard Business Class seat that transforms into a fully lie-flat bed. 9 L None No Power Seat 9 L is a standard Business Class seat that transforms into a fully lie-flat bed. 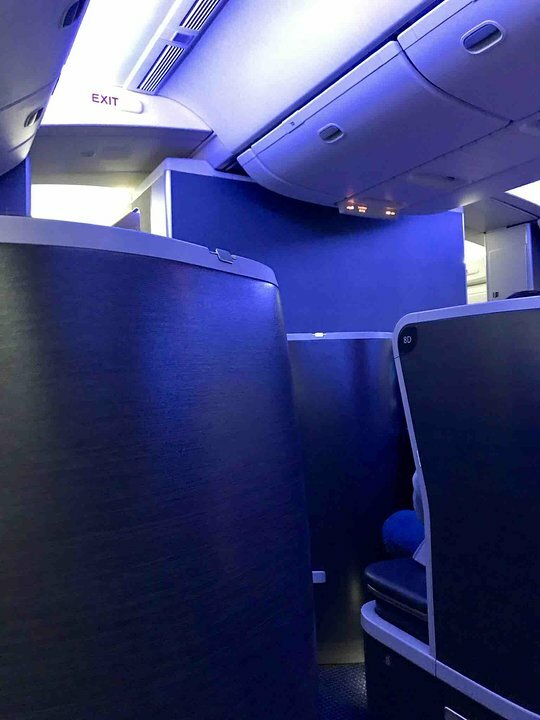 The American Airlines Boeing 777-200ER featured here presents the airline's new Premium Economy product. The aircraft is configured with seating for 273 in three cabins including Business Class - featuring 37 seats that transform into fully lie-flat beds, Premium Economy - featuring 24 recliner-style seats plus additional legroom, and the Main Cabin Economy Class - featuring 66 Main Cabin Extra seats offering extra legroom and 146 standard Economy Class -style seats. Amenity features include personal Audio Video On Demand (AVOD), access to 110v power ports, and USB power ports at every seat on the aircraft. I found the new Premium Economy seat to be comfortable and I was able to sleep through most of this red-eye flight. American's cabin staff were helpful and friendly and the food was quite tasty for airline fare. No problem storing carry-ons despite being a full flight. The 777-200 is a fabulous aircraft. Excellent seat. Way more legroom than the rest of the cabin (bulkhead rows). Extra footrest as well. Well worth the extra money on DFW-Hawaii routes. Highly recommend. Is good and have a window but have a bathroom sound! Great legroom and there is a cutout in the bulkhead to allow for storage under the seat in front. The cutout is only about a foot high (if that), so you can't fit a very deep bag under there. A backpack fit just fine. Poor seat width due to the aircraft configuration (10 seats wide in economy) and tray table within the armrest. I would choose this seat again. Great lie-flat seat for LAX-MIA. Each is like a private pod. We had 1D and 1H. Unlike previous reviews, there was no divider separating them, so we could turn and see each other. Seats 1A and 1J are nearly a row behind, so seats 1D and H have total privacy at the front of the cabin. Several storage drawers reveal a tv remote control, charging outlets, headphone outlets and amenity kit. The aisle-side drawer reveals Bose noise-cancelling headphones which the flight attendant collects before landing. The aisle armrest raises and lowers for desired height. We had no issues with the forward lavatory being in front of us and found it very convenient. No one ever stood near our seats. We would definitely select these seats again and hope to be in them again for a longer flight! Had flight 5, seat 5D, DFW to HNL. Wonderful seat (even with no window view), bathroom was awesome, food and tv / movie selection was great. Permanently ruined flying anything but first class for me on 3+ hour trips and we will purposely select the 777 for travel out and back next time we go to the islands. WAY better than the 757 "first class" we had overnight on the way back. Private seat but only 1 window. Noise from lavatory. Sat in 13J and 13L from DFW to HNL, and the same seats back from HNL to DFW. Flight numbers AA 5 and AA 8. From DFW to HNL the space from the seat to bulkhead was a good 6" more than the flight from HNL to DFW. So the leg space for Row 13 is different per airplane even though it's the same 777-200 V2 layout. The Premium Economy product was good although since this is considered a domestic flight you DO NOT get upgraded meals, nor a Bose headset, like you do on International PE flights. Not having under seat storage in front of you was not an issue because the overhead compartments in this cabin and reserved for PE customers only, so carry on space was not an issue. For taller people, the Row 13 leg rests are useless, but for a shorter person, like my wife, it was perfect and comfortable. The infotainment TV was great and functional. The seat width, privacy, location, and comfort were all great. Overall, if you don't mind paying a slightly overpriced premium for these PE seats, I'd recommend Row 13 over Rows 14 and 15 due to increased leg space and overall moving space. Seat is great, galley is no issue. DFW to HNL was great in BC. 1H has lots of room and was very comfortable. Very quiet and private as it was actually slightly ahead of 1A & 1L. Sat in business class between DFW and Maui. Highly recommend BC. I didn't feel exhausted after flying 7+ hrs because I was able to stretch out the entire flight. I flew backwards going to Maui and it felt weird. BC has two sections. I recommend the first section as there's more privacy and not as bright as the second section. Really happy with these business class seats 3L & 4L. Very confortable, storage on side near window, not very deep, but very convenient. People with size 13+ shoes may have issues fitting feet under the console. CDG-MIA 3 pax; for 14L good legroom ( I am 6'2") and seat comfort for 9.5 hr flight. Nice amenity kit w bigger pillow and overear headphones. 13J almost 5 ft of legroom to bulkhead.Overhead bins say reserved for PE which is nice, hold 2 rollaboards sideways.Overall very satisfied with PE. Massive aircraft. Wonderfully quiet. Had seats 17A,C,J,L. Tons of legroom. Absolutely no hip room. Crew was rude and unapologetic. Gentleman behind us in row 18 got bashed by the service cart and was not even acknowledged. Free drinks in MCE now. So that was a +. My husband and I sat in seats 17A and 17C on our return to DFW from Maui. They were excellent seats for a 6+ hour flight. We had no one sitting beside us, so it was easy to get up to use the restroom. They are bulkhead seats, so we had to place our items overhead for takeoff and landing, but not a big problem. The window view is "OK". The seats are over a wing, but we were still able to view a beautiful sunset. I would select these seats again. We sat in 18K & 18L and had someone next to us at 18J. I'm 5'9" and legroom was great. Since there isn't a seat in front of 18J, I was able to get in and out of the row without bugging the guy too much. He wasn't forced to get up and could just shift his body a bit which made me feel less bad and if you're looking at 18J, you wont have to worry about getting up for people. It is one of those rows where the window is closer to seat-back of the row ahead of you but that wasn't much of an issue for us. 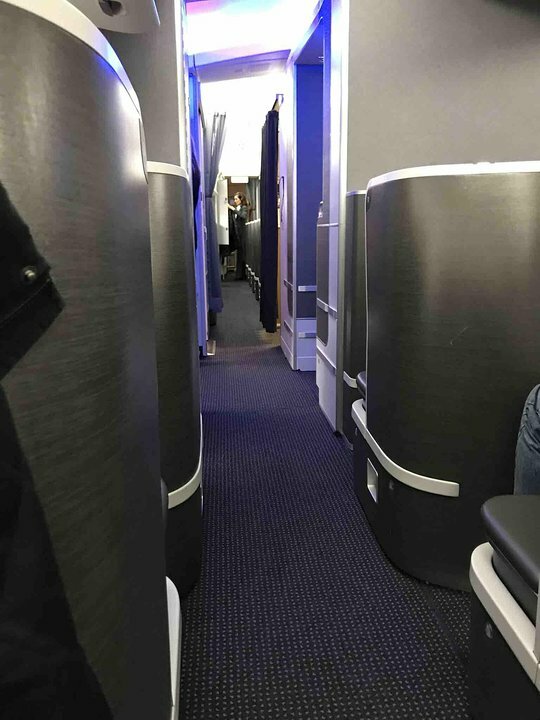 Flew on Flight 71 FRA to DFW on 4/6/2018; I'm 5'9; this seat was comfortable and the leg room was good for me. Although there were only 2 of us on this row, the other on the opposite end. The seat width was enough for me. I'm glad I was able to fly on this version for a 10hour flight.